I, for one, am not the heaviest PC gamer out there; however, I’ve been looking for a functional keyboard and mouse to replace my Logitech Wireless Keyboard and Mouse combo (which I loved, btw,) that I’ve had for about a solid year now. Enter the steelseries Apex Gaming Keyboard and Rival Gaming Mouse. At a combined total of $159.98, this combination of keyboard and mouse may not be the cheapest, but it is certainly pretty damn effective, and not just for gaming, either. Let’s begin with the Apex Gaming Keyboard. This behemoth does it all. The Apex Gaming Keyboard isn’t your typical run-of-the-mill gaming keyboard. Right out of the box, you’ll be able to notice its considerable size and weight. When I showed off the keyboard to my mom and sister, they were impressed by the size and mass of this behemoth. I thought it was a mechanical keyboard at first; however, the fact that they used the silicone domes, while it doesn’t bother me personally, mechanical keyboard lovers will be put off by this. It also took me a while to get used to the placement of the keys, but once I got comfortable, using the Apex felt like a dream. Outside of the sheer behemoth that this keyboard is, the steelseries Apex Gaming Keyboard has a slew of impressive features at its fingertips. The first one is the Windows lockout system. By holding down the steelseries key and the Windows key, users can disable the Windows key, effectively saving them the trouble of accidentally alt-tabbing their way to the Start menu or the Start screen during a high pressure situation mid-game, something that I’ve fallen victim to too many times. Anti-Ghosting technology imbued in the keyboard prevents lockout on the most needed keys such as the arrow keys, which also features two upward diagonal keys (up-left and up-right,) and the WASD keys and their surrounding keys, allowing you to hold down or press up to 6 of these buttons at the same time. Speaking of the upward arrow keys, I see no real benefit for them, unless you’re a fighting game fan who utilizes the keyboard for your Super Street Fighter II X fix. To you, I say Tiger Knee your heart out. The USB hub is a useful feature, and is activated via the USB Y-Cable on the keyboard itself. Just plug both USB 2.0 plugs into two ports, and the two USB pass-through ports on the keyboard will be powered. I utilize them for my PlayStation Silver Headset and my Rival Gaming Mouse. The most striking feature is the backlighting on the keyboard. All 140 keys (yes…one hundred and forty) are separated into 4 different zones which, through the steelseries Engine software, can be set to do several different lighting options, opening ~1 trillion different options for lighting. I’ve barely scratched the surface with my keyboard’s lighting, however, the lighting on this thing is great for late night sessions when all the lights are off. 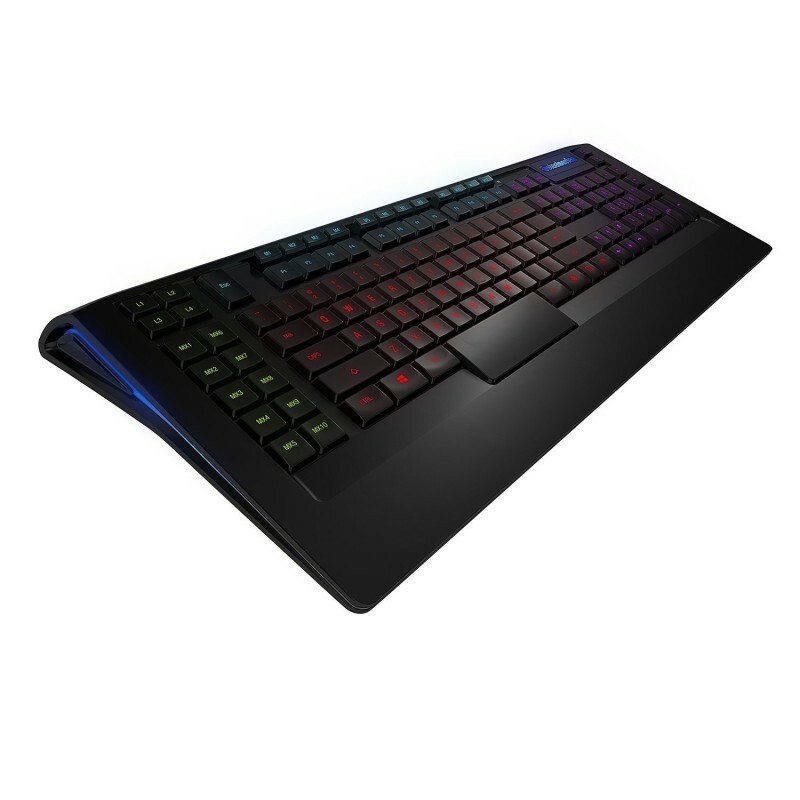 Add on tactile bumps on the W key for intense gaming sessions, as well as over 30 different macro settings to bring ease of play to your gaming sessions by binding certain combinations to a specific key and the fast response time whether you’re playing or doing everyday work, the steelseries Apex Gaming Keyboard will be your go-to keyboard for heavy daily usage. The most responsive mouse I’ve ever had. The $60 companion to the Apex Gaming Keyboard, the Rival Gaming Mouse is a godsend. The precision on this thing is nuts, and can be set with even more accuracy using the steelseries Engine software. Utilizing the Pixart PMW3310 optical sensor, the Rival offers true 1:1 tracking and movement, prevailing in high or low pressure gaming environments. Playing the OG Deus Ex, as well as some of the newer games with this mouse has never felt better. The lighing on the mouse can be customized just like the keyboard, with over 16.8 million colors, plus different modes of lighting in the form of Steady, ColorShift and Breathe, and a 3D printable nameplate, allowing for your Rival to have its own personality. It’s a right handed, claw-grip mouse, so left-handers are SOL, but despite that, it’s a comfortable fit, and can be used as your daily driver, simply because it doesn’t feel like your average gaming mouse. With only 6 buttons, the Rival doesn’t necessary stand tall on top of the gaming mouse mountain, but it is a solid foundation, and sometimes, less is certainly more. 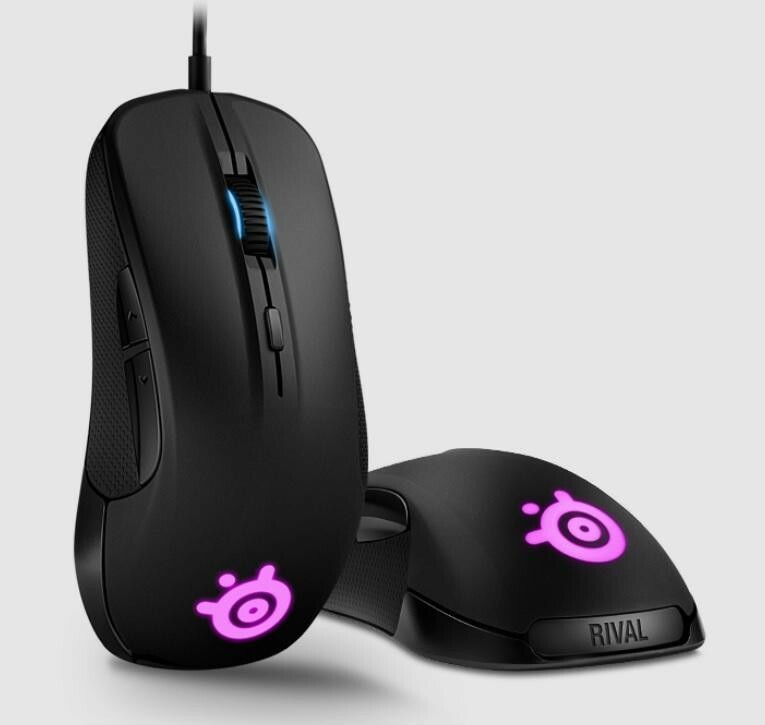 Additionally, the Rival Gaming Mouse has an adjustable CPI from 50 – 6500, so the sensitivity and the movement can be set to your liking, dependent on your reflexes and your intended usage. As someone slowly making his way to the PC Gaming world, this keyboard and mouse combo may be my go-to for a very long time. I’ve experimented with several different gaming mice and keyboards, mostly for my younger sister, who is a bigger PC gamer than I am, but I haven’t found one as comfortable as the the steelseries Apex and Rival. The level of customization, the comfort and the response time on both are more than reason enough to have these in your life, and I wouldn’t bet on anything less if you’re on a budget for gaming mice and keyboard.